From the pages of History. we got this exclusive JJTC A/C Bus pic from Arun Raj. Towards World class comfort and facilites of high performance and reliability. You’ve Just entered a Hitech Super Deluxe bus of the J.Jayalilatha Transport Corporation (JJTC). 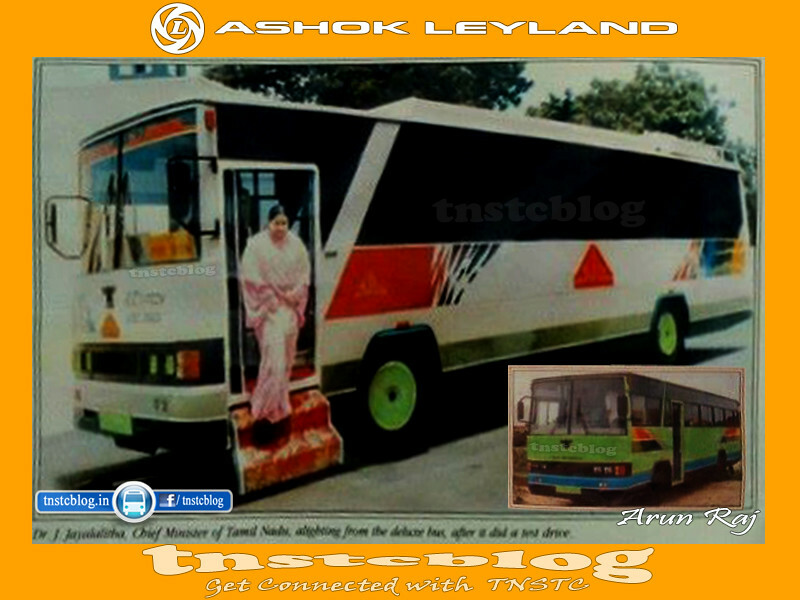 The bus body of this Hitech Super Deluxe is built on chassis made by Ashok Leyland and body build by Azad Coach. On September 1, 1994 the Air-conditioned luxury bus had its first run between Madras and Bangalore. The 36 Seater bus is equipped with pantry and toilet facility at the end of passenger. The interior is cloth lined and the roof is also pudded. To provide greater comfort to passengers, the back rest and seat base are made up of moulded Polyurethane foam. Aluminium Sheets on the body of the buses which is coated with Polyurethane paints enhance the life of the body and protect from corrission. The JJTC will soon acquiring 52 more buses the chassis for which will be manufactured by Ashok Leyland. The new buses will be intoduced on Trivandrum, Mysore, Thirupathi and Pondichery routes. Going by Customer Feedback, the JJTC proposes to remove the toilet facility and and a few more seats, where there is a great demand on routes. It will also operate 102 services including 55 Hitech Super Deluxe Buses. JJTC currently SETC State Express Transport Corporation buses were pioneers in introduction of A/c and Non A/c Hitech Deluxe buses in India The transport department authorites introduced world class quality buses to many important Interstate Destination these buses were rocking in South India. JJTC operated all interstate routes to neighbouring states from various Destination of TamilNadu specially Madras – Bangalore, Mysore, Ernakulam, Tirupathi and buses Trivandrum to Bangalore, Chennai, Pondichery and from Nagercoil, Tirunelveli, Thoothukudi, Sencottah to Bangalore. 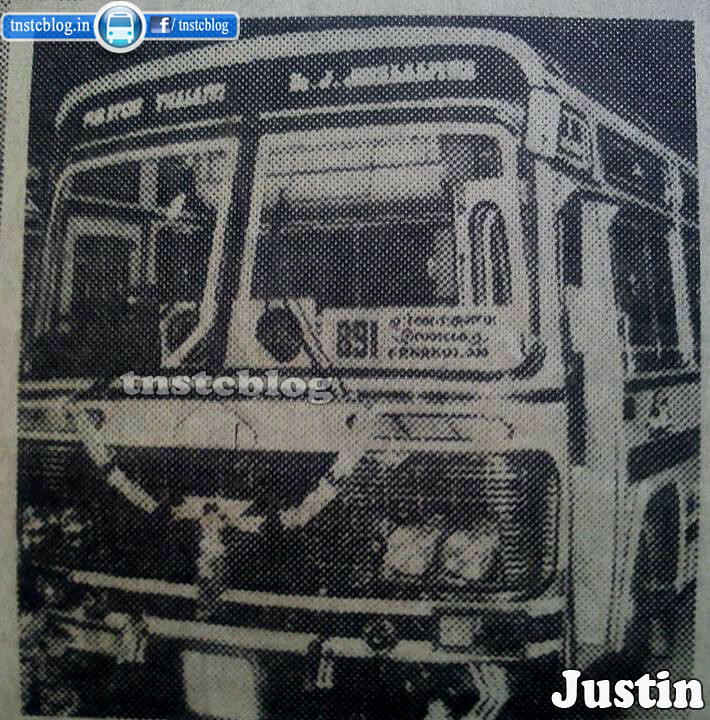 JJTC Buses were Super Luxurios and competite on par with Private players that they were struggling to competite with Governmrnt Buses these were one of the golden periods of TamilNadu Transport Department the first set of buses were built in SMK Prakash. The first bus had its run on route no 891 Chennai – Ernakulam. Thanks to Justin Raja Pandian Sir, Thisayanvilai for this 891 Ernakulam from Unknown Media Clip. Nice collection of Photos of JJTC. 1.PUDUCHERRY to VIJAYAWADA (Distance=613KMS) via.CHENNAI-CMBT, NELLORE, ONGOLE. 2.PUDUCHERRY to BELLARY (Distance= 564KMS) via.VELLORE, ANANTAPUR. 3.PUDUCHERRY to HUBBALI (Distance=723KMS) via.VILLUPURAM, TIRUVANNAMALAI, BANGALORE. 4.PUDUCHERRY to SRINGERI (Distance=638KMS) via.VILLUPURAM, TIRUVANNAMALAI, BANGALORE. 5.PUDUCHERRY to MANGALORE (Distance=661KMS) via.VILLUPURAM, TIRUVANNAMALAI, BANGALORE. 6.PUDUCHERRY ti MYSORE (Distance=476KMS) via. VILLUPURAM, SALEM, SATYAMANGALAM, NANJANGUDU.